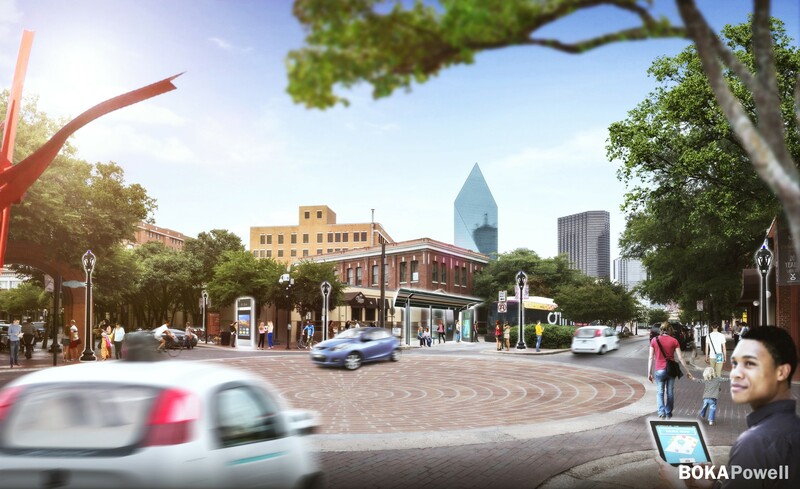 A rendering by Boka Powell illustrates the smart features coming to the Dallas West End. If you love the Historic West End District now, get ready to fall in love with it again! Home to The Dallas World Aquarium, the Sixth Floor Museum, and many delicious downtown restaurants like Ellen’s Southern Kitchen and Hoffbrau Steaks, the West End is full of life. According to the Dallas Innovation Alliance, this makes the West End the perfect neighborhood in downtown Dallas to test the city’s newest technology including public Wi-Fi. What is already available in cities located in Asia and Europe, this technology will enhance the West End’s proficiency and make living, working and playing in the area more dynamic. While many coffee shops and restaurants already offer free public Wi-Fi, having this amenity gives residents and visitors in the neighborhood many advantages like unlimited browsing and more ways to connect with the digital world. As a testing ground for public Wi-Fi, the West End will become a testing ground for ways to cut costs, boost energy efficiency and improve public health in the city of Dallas. In this new-age, everyone is glued to their smartphones and tablets. These devices are a major part of our lives and help us stay informed and capture memories. With public Wi-Fi, every resident or visitor will be able to have this ability when in the West End Historic District. Think about it. When taking in the sites of the mesmerizing exhibits at the Dallas World Aquarium with your family, you will be able to take pictures and share them unlimitedly. When meeting with friends in the neighborhood, you will be able to share your location instantly for easy accessibility. Or maybe you work in the West End and want to work on your laptop on the patio of a restaurant in the West End. Public W-Fi will make it possible. Smart Streetlights – These streetlights aren’t just any streetlight. They will be powered by LED lights and will be able to measure air quality and sensors that can detect crowds or noise. Interactive Digital Kiosks – These cool kiosks will have features like cell phone charging stations, touchscreen maps, and public transit schedules. Improved Network Connectivity – The West End will have improved network connectivity including fiber and cellular coverage. Smart Parking – As a smart city, there will also be smart parking infrastructure that will give visitors the ability to quickly and easily locate available parking and reserve a parking spot ahead of time. A Mobility App – This app will allow West End visitors to search for transportation options that include public transit, ride-sharing, bike sharing, walking and smart parking. Solar-Powered Waste Management – The solar-powered trash cans will use sensors to allow waste management to detect when trash cans need to be emptied. Open Source Software Platform – Open source software platform will collect data and provide opportunities for citizens, entrepreneurs, and organizations to build smart city applications on top of the platform. When Will Public Wi-Fi and the Other Technology Debut in The West End? So, when will this smart city technology be available in the Historic West End District? You can look forward to the intelligent streetlights, kiosks, public Wi-Fi and waste management to begin by the end of this year. To learn more about the smart city technology being tested here in the West End, check out the Dallas Innovation Alliance website.